Dazed & Confused - Encore! 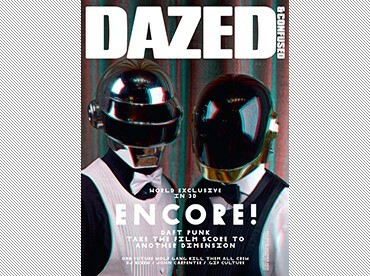 The December edition of Dazed celebrates radical visions for the future, with a world exclusive feature with Daft Punk in LA as they unveil their soundtrack for 3D sci-fi blockbuster TRON: Legacy. The issue of the magazine comes with specially inserted glasses to see the spectacular 3D shoot by photographer Sharif Hamza, styled by senior menswear editor Robbie Spencer. Digital dance overlords Daft Punk reveal all to Dazed editor Rod Stanley about their score for the year's biggest sci-fi spectacular. Check Dazed Digital tomorrow for more Tron: Legacy news. Spending time in LA with the gang of filthy-mouthed skate-rat rappers currently blowing up just about everywhere. Radical Juxtapositions styled by the Dazed fashion editors: His & Hers by Ben Toms and Mattias Karlsson, Cut & Paste from Damien Blottiere and Robbie Spencer, Hugh Lippe and Karen Langely's Inside Out, and Wet 'N' Wild by William Selden and Katie Shillingford. Plus we speak to Calvin Klein's Italo Zuccheli about his S/S11 collection. Meet the techno freak kids employing an outdated animation technique to create radical future forms. Patrik Sandberg celebrates the simple animations that infiltrated the consciousness of a generation. An in-depth examination of how the visual style of basketball and hip hop have been intertwined since the latter's birth on the streets of New York in the late 70s. We trace the roots of the long standing love affair between bling, bounce and braggadocio. The prolific 85-year-old British author whose writing have been compared to Arthur C Clarke. The godfather of British science fiction talks to Dazed Deputy Editor Tim Noakes about life, space, having a story developed by Stanley Kubrick and a £24,000 sentence. A recent graduate, Gorman is the hottest young milliner to come out of London recently with an interesting use of materials including moulded plastic and a fast-growing following. Specialising in "extreme whatever-ness", Weirdcore makes abstract futuristic graphics, music videos, custom-made AV toys and tour visuals for artists such as Aphex Twin, MIA, Simian Mobile Disco, The Horrors, A-Trak, Cassette Playa and more. Here in conversation with visual maverick Oneohtrix Point Never. A huge influence on today's exploding 'witch house' scene that includes Salem, we examine the legacy of the creator if the Houston hip hop sound, a 'chopped and screwed' take on hip hop that was heavy, slowed-down and sounded particularly good on codeine-laced cough syrup. The master of 80s horror classics such as The Thing, Halloween and Escape From New York. Dazed visit him at home in Hollywood as he debuts his first film in nine years.